During my first year of high school, I befriended an upperclassman who shared my obsession with rock and roll music. The two of us were also similar in trying to expand our collective musical knowledge by exploiting every opportunity that presented itself to us so that we could explore uncharted music together. For my friend, an opportunity presented itself at his job. He “babysat” the automated music playlist at the local FM radio EZ listening station on weekends during the overnight hours. It drove my friend crazy. After only a few weeks of it, he began to think that the small wage that he was earning was enough to endure the 6 hours of Ferrante & Tiecher format that pumped through the studio monitors. Never mind the fact that he barely uttered a word during his shift as the only time you would even hear him over the air was reading the weather forecast twice an hour, and even that was committed to tape. The inactivity gave him a lot of free time. He began to snoop around the facilities and noticed that the Program Director for the station occasionally left the door to his office unlocked. During one clandestine operation, he discovered that the shelves of his boss’ office contained a huge array of promotional records, some of which the PD brought from other radio stations. Instinctively, he began to stuff his book bag with some of the titles, not with the intent of stealing them, but instead to borrow them until the next airshift so that he could dub them off on to cassette. He began inviting me over to his listening sessions, and I would dutifully wait my turn to fill up a few blank Maxells. The records were mostly A.O.R. titles that graced the cutout bins while providing a glut of promotional albums that would find their ways into the personal collections of radio programmers across the country. I listened to a lot of new music thanks to my friend’s system, everything from Graham Parker to a live Ramones record (It’s Alive). Every week was a new adventure. On occasion, you’d get a real dud–The Boomtown Rats Tonic For The Troops immediately comes to mind–but the beauty of magnetic tape was how its contents were just a red button away from extinction. Conversely, there were those records that proved to be so good that I would punch out the safety tabs on the cassette, a feature that prevented someone from accidentally erasing over a particular selection. Such was the case with Roxy Music, whose live document Viva! made its way to my friend’s turntable and onto a waiting cassette that stayed with me for many years. I loved the record’s aggressiveness. In fact, it may be the only document of the group that suits the sonic vision that their own name coolly suggests. I fell into it with such great force that I ordered their newest title from Columbia House, Avalon, and became immediately disappointed that they had turned into a bunch of pussies with that record. Time, repeated listens, and that silly notion of how Avalon is required coitus music, have changed my perspective of that record, but Viva! has always remained my first love, and the first reason why I began exploring the group’s catalog. Viva! is not found on the recent The Complete Studio Recordings (for obvious reasons) and it’s a record that is curiously overlooked by many Roxy fans. The chief complaint that I hear from them is actually one of the reasons why I love with the record: its brevity. Clocking in to just barely fit on to one side of a C-90 tape and providing only eight songs to promote a very worthy catalog, Viva! Roxy Music demonstrates a very progressive rock band, one that sounded heavier than their studio versions and one that possessed some very real rock and roll chops. Beginning with “Out Of The Blue,” the opening track finds drummer Paul Thompson trying to knock the “art rock” label right off the gallery walls. Guitarist Phil Manzanera weaves a very hypnotic guitar phrase while Andy Mackay’s lays down a haunting oboe…that’s right, oboe…making this version a very good candidate for actually being better than the studio version found on Country Life. This high-energy mix is apparent on nearly all of the tracks on Viva! suggesting that Roxy Music was a band of very capable and exciting performers, ones that contradict the button-down persona of their image. The record clearly proclaims the musicians to be worthy enough to energize even the most pretentious of fans who may view Roxy Music as somehow beneath such primal urges. 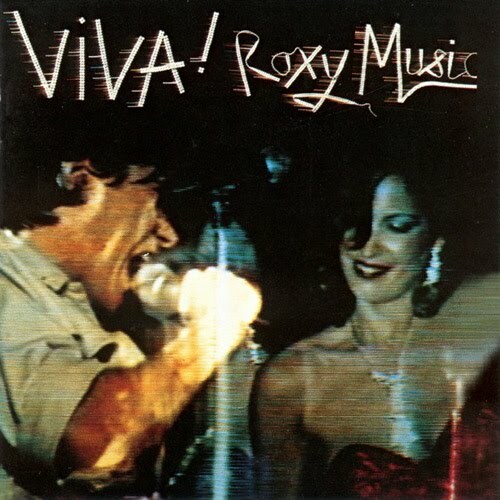 Now that we’re all giddy from the nostalgia that The Complete Studio Records brings, and now that the box set correctly bestowed Roxy Music as one of the genre’s most creative forces, it’s time to consider Viva! into the tapestry. It’s a unique document of the band, rolling up their sleeves and slugging out an honest day’s work on stage and on fire. Another example on Viva where the live version is superior to the studio version is If There Is Something. That song is absolutely amazing. The studio version is marvelous but, like Out of the Blue, there is even more intense energy poured into the version on Viva.